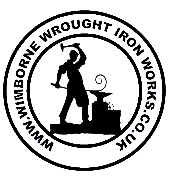 This privacy statement sets out how Wimborne wrought iron works ('we' 'us' or 'our'), who operate this web site located at www.wimbornewroughtironworks.co.uk ('Site'), use the information you give us. We may change this privacy statement at any time by posting such changes on the Site. Your continued use of the Site after notice of changes shall mean you have agreed to the new privacy statement. We are committed to respecting your privacy. Once you choose to provide us with any information by which you can be identified, then you can be assured that it will only be used in accordance with this privacy statement. By using the Site you agree to this use. For your protection, we are registered under the Data Protection Act 1998 and have given all appropriate notifications to the Information Commissioner. WHAT WE COLLECT We may collect the following information: Where you order products, we will collect your title, name, contact details, delivery address, billing information, transaction and credit card information. We may also ask you to provide us with information regarding your personal or professional interests, demographics, experiences with our products, and contact preferences in order to provide you with further correspondence about our products and services. WHAT DO WE DO WITH THE INFORMATION WE GATHER? We require this information to understand your needs and provide you with a better service. In particular, we may use your information for the following reasons: Internal record keeping; Analysis purposes to develop and improve our products and services; To allow our representatives to follow up, either by e-mail, phone or mail, people who have purchased goods from our site as part of our customer care procedures; unless you say otherwise, to periodically notify or allow third parties to notify you about special offers, new products or services (either by post, telephone, e-mail or otherwise) unless you have registered with the appropriate Preference Service; From time to time, to contact you for market research purposes. We may contact you by e-mail, phone or mail. For the prevention and detection of fraud or if the law permits or compels us to disclose it or we otherwise have a duty to disclose it to a third party; Cookies Cookies are pieces of text information generated by a web server and stored in your computer, depending on the level of your browser settings, the browser may ask you to accept or decline the cookie. If prompted, accept the cookie. We currently use two types of cookies: 1 - session cookies and 2 - non-session cookies on the Site. The session cookies are temporary and are automatically deleted when the browser is closed. The non-session cookie is only placed on your computer if you register or choose to be remembered by the web site. A cookie does not give us access to your computer or any information about you, other than the data you choose to share with us. This practice is strictly in force. You may set your web browser (Microsoft Internet explorer or Netscape navigator) to notify you of cookie placement requests or decline cookies completely. You can delete the files that contain cookies – those files are stored as part of your Internet browser.